Best Backpacking Stove – Learn which stove gets the top rating! Why Whisperlite gets top rating! Do you want to know what the BEST backpacking stove is? Having tried MANY camping stoves, looking up other peoples reviews AND guiding canoeing trips, I have found what I consider to be the best stove for backpacking and interior camping. I used this camping stove for years when I guided back country canoe trips (I tried many different stoves while doing this job). Then when I went to purchase my own years later, why I purchased this stove. I consider it to be the BEST stove (and what I use when guiding and what I personally use and own). With so many different stove options out there, you want to know which is the best one! I don’t blame you. But, lucky for me, I got to try many different stoves FOR FREE with work. But…You can’t afford to try EVERY stove out there…. So, I’ll share which is the best backpacking stove. Why is this the best backpacking stove? · Lightweight - it weighs only 14.5 ounces. · Multiple Fuel types - it can use many fuel types (not just one) including: White gas (camp gas)- which burns the cleanest, but it can also burn, kerosene and unleaded auto fuel. In fact, some users have even used alcohol, diesel, fuel oil, and even aviation fuel! – most stoves can only use ONE kind of fuel. · Size - small and compact - store it inside your nested pot to save space and keep it safe! · Re-fillable bottles - This is great for the environment, as you don’t have to continue to purchase propane bottles, plus it saves you money! · You can bring as much or as little fuel as you need in re-fillable bottles of many sizes. These don’t come with the stove, but are pretty inexpensive, and you can pick the size that suits your trips best. · Cooks Quickly - 1 litre under 4 minutes! · Economical on Fuel – it hardly uses any! · Clean it and maintain it yourself- Includes part kits, and the stove comes with full instructions for dis-assembly. · Bag - comes with a convenient bag. · Long lasting and sturdy - We used these over and over on interior camping trips with youth that weren’t as gentle as they could have been. These stoves held their own. · Uses many fuels - including: white naptha (camping fuel), and if you can’t get that fuel, you can use kerosene and even unleaded auto fuel! · It can be taken on the plane (drain the lines and it can come on the plane). Many stoves can’t fly because they have residual fuel in their lines. Before I decided to purchase this stove for myself (this was my OWN hard earned cash I was spending now…), I wanted to do a bit more research (just to make sure there weren’t any better ones). other peoples reviews on Amazon. , and it was given a total rating of 4.6 of 5 based on 34 reviews! Check them out yourself! The last time I checked it was less than $100. Make this your first and last stove that you buy! From someone who has tried many different stoves and can say what lasts and I like the best. This is MY choice! Make this your only stove that you’ll ever need to buy! Purchase the MSR Whisperlite international now. Check out others reviews of the MSR whisperlite international. 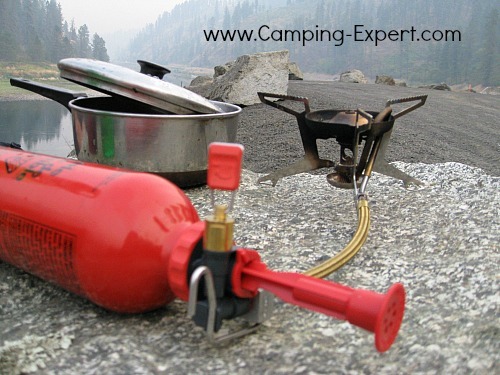 Learn what other camping gear I recommend.